Our Assisted Living Facilities are available in Brookdale’s freestanding senior living communities, and as part of a full continuum of care on a single campus. The Brookdale approach provides services that are tailored to each individual’s unique needs, a way of life created to enrich the lives of others – with compassion, respect, excellence and integrity. In this way, we can make daily life easier for our residents, by offering the desired service and care as their needs and preferences dictate. By customizing personal care offerings for the individual, we help to ease assisted living residents through lifestyle transitions that complement their vision for all the places they would still like their lives to go. Memory Care communities, which include Alzheimer’s care and Dementia care facilities, consist of specially designed living spaces and supporting environments for those who are living with cognitive challenges brought on by Alzheimer’s care and dementia. These may include carefully considered flooring to reduce problematic patterns for those with Alzheimer’s or dementia and wall colors that help them to find the way. 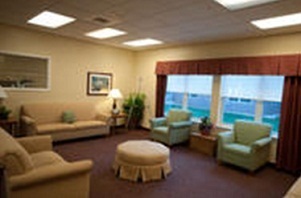 The dementia care environment helps cue its residents in their daily lives. Areas of the community are set up for safe engagement in activities such as gardening, kitchen work, and other life skills that provide purposeful and meaningful successful moments. The Clare Bridge concept was created over 25 years ago and has evolved by continually embracing the latest research in dementia care, coupled with the experience of caring for thousands of people with dementia and their families. Today, Brookdale is one of the leading providers in Alzheimer’s care in the United States. All Clare Bridge associates receive ongoing guidance and teaching on the complex task of providing excellent dementia care. Associates receive initial and on-going training in proper techniques, approach, and care of persons with dementia. In addition, all executive directors attend the Clare Bridge Leadership Competency Training. An established set of protocols and techniques enables associates to better meet the unmet needs that are often triggers of behavioral expressions in persons living with dementia. At Brookdale, we believe in whole-community philosophy that empowers all associates to identify the unmet needs of the resident and their family and be a part of a solution. Dementia friendly menus that provide diverse offerings that can assist in full engagement in the dining process regardless of the level of dementia. Selections are easy to manage, familiar and are appealing to the senses. Individualized dining assistance preserves the resident’s use of utensils as long as possible. Small dining rooms with consistent seating, which encourages familiarity and socialization. Music, centerpieces, warm scented wash towels and fresh linens enhance the dining experience.